Chemtrails have been fogging the skies for over a decade, and have never been officially addressed by the government. A decade ago, when the Zetas were first asked about the phenomena, chemtrails were making people sick with flu-like symptoms. Per the Zetas, this was the original intent of the chemtrail program. ZetaTalk Explanation 12/15/2001: Contrails are an experiment of the wealthy and powerful, to see how much deliberate infection of the wandering masses might slow them down. This has been allowed, where practiced, because the experiment was couched in terms of crowd control. Those allowing this to continue, the military and national security groups, were assured that only temporary illness would occur. However, the intent of the elite was scarcely temporary illness. Imagine elite groups settling into North Carolina estates, or in valleys in Utah, or in Wyoming. Why would they want masses of the lower class, starving and angry, invading their communities? There would certainly not be food or supplies enough to go around, and these elite do not think of the populace as anything on an equal basis to themselves. Their logic is that if these starving hordes are to die anyway, the sooner the better! The original intent was to poison migrating hordes during the weeks leading into the pole shift, and the chemtrail runs ongoing a decade ago were practice runs to test the effectiveness of various germs or chemicals. Clinics filled up with sick children and the very young and very old at times succumbed and died because of these experiments. Still, during the Bush administration, the government did not appear to be addressing the issue. Someone was poisoning the citizens of the US, yet the US was apparently looking the other way. But per the Zetas, a change occurred behind the scenes. The chemtrail program had been using the military, to some extent, because it was claimed to be a crowd control experiment. When the military found out that the intent was to poison and kill citizens during the tense weeks leading into the pole shift, they rebelled. ZetaTalk Explanation 8/15/2000: Beginning in the year 2000, the patterns of chemtrails had created an alarm in the populace to the extent that public outcry was becoming organized and vociferous. Rally's were being held, petitions signed, and documentation on harm to children and other vulnerable segments of the population showing that the tests being run were not as harmless as claimed. Those in the government aware of the chemtrail tests had been assured that no harm would come to the populace - a slight increase in flu symptoms, a few days lost at work or school, but all in all, relatively minor complaints. That the threshold putting a sick child or oldster from the sick bed into the coffin was occurring set those among the wealthy and powerful elite at odds with each other, and behind the scenes wars over allowing the chemtrail tests to continue broke out, unseen to the public eye but nonetheless fierce. But the wealthy continued to fog the skies, switching from making the populace sick with flu-like symptoms to merely practicing wind-drift. As Planet X moved into the inner solar system and at times became visible as a second sun at sunrise and sunset, chemtrails had a secondary purpose - to fog up the skies so the population would not be startled by a second sun sightings, and start asking questions. Question: What are the factors that cause seemingly random days of high chemtrail activity? Is it the bright sun in a blue sky? A full moon? Weather or temperature related? The population below in the sprayed area? Anything else? ZetaTalk Explanation 12/22/2007: We have mentioned that chemtrails originally had the purpose of testing how well humans in the flight path could resist various microbes and chemicals that would sicken them. The point was to delay them as they attempted to migrate toward enclaves of the wealthy, for instance, to sicken those leaving LA and trying to reach Utah. Behind these tests was a more sinister purpose, to poison and kill the migrants. When the US military discovered the plan, being openly discussed at times in the back rooms of the White House, they rebelled and refused to have any part of chemtrail activity in the future. Where the campaign was being conducted by the wealthy, their plan was to use the US military when the time came, and without the cooperation of the US military, this plan could not succeed. Thereafter, chemtrails were used to fog up the view of Planet X. In some cases, tests were done to determine where the drift would go, where the chemtrails were pushed by the prevailing westerlies. Since sunrise and sunset are the danger times when Planet X might be sighted, these are the main fogging target times. Is there evidence that the wealthy are conducting these chemtrail wind-drift experiments and trying to prevent the population from catching a glimse of Planet X? One of the best documentaries that small planes are conducting the chemtrail assault is this video [video now removed by YouTube]. 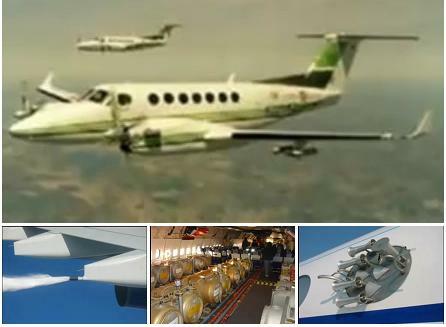 Numerous photos of the chemtrail apparatus on small airplanes can leave no doubt. After Obama won the presidential election, some who had been affected by chemtrail practices noted a change. Question: The chemtrails got a little brazen this week in North Carolina when they made little half loops around the sky. Clearly, these weren't from planes going back and forth to airports. We've had a number of days without any chemtrails but this week they were very, very heavy and some of the oddest ones I've ever seen in a sort of loopy fashion. Do you know why they have changed their pattern after all these years of pretty much straight lines? ZetaTalk Answer 12/6/2008: Like any enterprise designed to keep the public in the dark, this enterprise is breaking down. The elite, who fund this enterprise, see the world's economy falling apart, the banking systems on life support, and fear riots in the near future. They question the worth of funding the chemtrails battle when the Earth changes are becoming so obvious. The Earth wobble is palpable to anyone trying to make sense of the weather swings and the positions of the Sun and Moon. Soon even those who never look out their windows will begin to notice, so goes the logic, so why bother to cloud their view! The Bush administration has been turning a blind eye to those laying chemtrails, and thus the elite also fear prosecution under Obama, or at least being pursued by prosecutors. Thus, chemtrails may only be laid in those localities where the enterprise feels the local establishment will support them. North Carolina is certainly one of those states. To counter the bad rap that chemtrails were getting, rumors were spread that this program was to help mankind, to deflect the Sun's rays and slow the progress of Global Warming. Recently Obama's new science advisor even announced the possibility of "shooting pollution particles into the upper atmosphere" to counter the Sun's rays. The president's new science adviser said that global warming is so dire, the Obama administration is discussing radical technologies to cool Earth's air. John Holdren told the Associated Press in his first interview since being confirmed last month that the idea of geoengineering the climate is being discussed. One such extreme option includes shooting pollution particles into the upper atmosphere to reflect the sun's rays. Mr. Holdren said such an experimental measure would only be used as a last resort. At first, Mr. Holdren characterized the potential need to technologically tinker with the climate as just his personal view. However, he went on to say he has raised it in administration discussions. Mr. Holdren, a 65-year-old physicist, is far from alone in taking geoengineering more seriously. The National Academy of Science is making climate tinkering the subject of its first workshop in its new multidiscipline climate challenges program. The British parliament has also discussed the idea. Could this be an attempt to put the chemtrail fogging operation being conducted by the wealthy into government hands? Per the Zetas, there are insiders in the federal government who are sympathetic to the cause. This trend needs to be closely watched. ZetaTalk Explanation 11/22/2008: Chemtrails are not a product of the US government. It is a private affair, planes and chemicals and all. The US government is aware of who is doing this, or at least the insiders are aware, and thus they could make this a prosecution matter. However, since those who are aware of who is responsible are in on the scheme and are not sharing this information with others who might wish to stop the practice, evidence is unlikely to fall into the hands of those who might prosecute. In time, and not that long in the future, this maneuver will no longer work and evidence of Planet X will be before the common man, undeniably. Accounts of local currency being printed, to displace the dollar, are in the news. This is a practice that occurred during the Great Depression as a result of bank failures and the lack of ready cash. This time around, there are still plenty of dollars afloat. The reason given for printing local currency is to promote commerce at local businesses. A small but growing number of cash-strapped communities are printing their own money. Borrowing from a Depression-era idea, they are aiming to help consumers make ends meet and support struggling local businesses. The systems generally work like this: Businesses and individuals form a network to print currency. Shoppers buy it at a discount - say, 95 cents for $1 value - and spend the full value at stores that accept the currency. Workers with dwindling wages are paying for groceries, yoga classes and fuel with Detroit Cheers, Ithaca Hours in New York, Plenty in North Carolina or BerkShares in Massachusetts. During the Depression, local governments, businesses and individuals issued currency, known as scrip, to keep commerce flowing when bank closings led to a cash shortage. During the Great Depression eight decades ago, confidence in the national economy was so shattered, and people's ability to earn cash so limited, that thousands of communities created local currencies to save hometown commerce. Provincial dollars allowed businesses and their customers to exchange goods and services with currency that had regional worth. A Detroit trio of small-business owners are reviving the idea, following an emerging national trend. The businesses are creating a currency called Detroit Cheers, and more than a dozen city merchants have already agreed to accept it as real money. Detroit Cheers joins an estimated 75 local currency systems that have sprung up recently in the US. Legal scholars say local currency is permitted as long as it doesn't resemble federally issued money. Per the Zetas, the world will steadily move toward the barter system, and after the pole shift this will be the mode. Government will be on the local level, if government exists at all. ZetaTalk Prediction 7/15/1995: Consider what constitutes the government of the United States, which we will use as an example, as it is indeed the strongest government, and the first and foremost democracy. This government, by and for the people, is founded by elections. Elections even in the best of times are difficult to pull off. Turnout is frequently low. Counts must be checked and rechecked for accuracy, and computers and the ready hands of volunteers assist in this process. And then there is the pre-election publication of candidates and their views, debates and other such enlightening affairs. We are not describing a world where the established government is likely to continue as it was. We are describing a world where new forms of governing will emerge. On the local level, there may be some continuance, according to the competence of the local government. Leadership will have to be earned. If local elections and local currency are likely to emerge, what about local militias? This is likely to emerge, and well before the pole shift. Take the case of the Stockton, California militia, which is emerging because of anticipated cutbacks in the Stockton police force. Alan Pettet, who announced Monday he is forming an armed militia to patrol Stockton, said Friday that 270 people have called to sign up and that he has had attention from such media outlets as National Public Radio and "The Rush Limbaugh Show." Both the city administration and the Police Department said to roam Stockton in cars with loaded rifles - as Pettet, a midtown neighborhood advocate, has proposed - would be illegal and unwise. Pettet said the militia would only "activate" if the city lays off police officers, causing some residents and officials to speculate he is only posturing to dissuade City Hall from laying off officers. The city is trying to balance a $31 million budget deficit and plans to lay off at least 43 officers by summer. Pettet, 66, said he is serious. Per the Zetas, after the pole shift and perhaps well beforehand, survival communities will have to be concerned with defending themselves against marauding gangs. Calling 911 or calling the police will not be an option. Self defense will have to be a local affair. 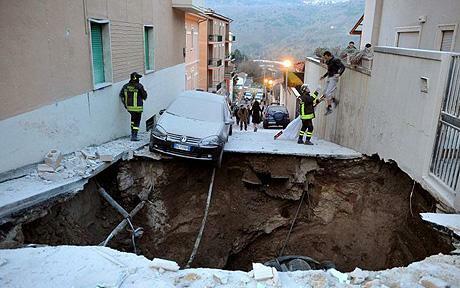 A devastating quake struck in Italy. The devastation was not due to the official size of the quake, a mere magnitude 6.4, but due to the age and lack of retro-fitting of the buildings in the ancient city of L'Aquila, the epicenter of the quake. The death toll is 278, with four bodies still unidentified. Twenty of the dead are children under the age of 16. The job of rescuers was being made more difficult by tremors that continue to shake the region. Almost 20,000 people are being forced to brave the cold nights in tents after Monday's quake destroyed their homes. 10,000 to 11,000 others are staying in hotels. Per the Zetas, the region should anticipate more such tragedies, as Italy lies on a fault line and the African Plate is steadily rolling. ZetaTalk Comment 4/11/2009: Fault lines that run through the Mediterranean will of course participate in the uptick in earthquakes like the rest of the world. We have stated that the quake uptick would increase dramatically. Quakes are still being under-reported, dumbed down, and eliminated from the databases to skew statistics. Nevertheless, in populated areas, the USGS feels constrained to report quakes with a measure of honesty. Italy can expect more such quakes, of greater magnitude, and with greater frequency. Why would Italy be exempt from our predictions? It is in a quake zone, and the African plate is rolling in place. Compounding the problems Italy can expect is a reluctance of the establishment to alert their citizens to danger. Just days before the quake, the authorities reassured the populace of L'Aquila that all was well. Yet a build-up of radon gas had been sensed by a concerned citizen, who was forced by the local police to remove his YouTube warning and fall silent. Mr Giuliani told locals to evacuate their houses and posted a video on YouTube in which he said a build-up of radon gas around the seismically active area suggested a major earthquake was imminent. Several tremors had been felt in the medieval city of L'Aquila, around 60 miles east of Rome, from mid-January onwards, and vans with loudspeakers had driven around the city spreading the warning. But instead of heeding Mr Giuliani's warnings, the local authorities reported him to police for "spreading alarm" and he was told to remove his findings from the internet. The local authorities are already facing serious questions over why they gagged Mr Guiliani rather than taking his findings seriously. Italy's Civil Protection agency held a meeting of the Major Risks Committee, grouping scientists charged with assessing such risks, in L'Aquila on March 31 to reassure the townspeople. "The tremors being felt by the population are part of a typical sequence (which is) absolutely normal in a seismic area like the one around L'Aquila," the civil protection agency said in a statement on the eve of that meeting. "It is useful to underline that it is not in any way possible to predict an earthquake," it said, adding that the agency saw no reason for alarm but was nonetheless effecting "continuous monitoring and attention". Per the Zetas, Italy will not fare well during the coming pole shift, for many reasons. In addition to lying on a fault line, the sloshing waters of the Mediterranean and exploding volcanoes will create many hazards for those trying to ride out the pole shift in Italy. Italy Prediction 2001: Italy has several strikes against it during the coming pole shift, which will be more severe than the dozens of pole shift cycles leading up to the present. It rides atop or next to many fault lines. It is home to large volcanoes known to go off like fire crackers during pole shifts. It is a narrow peninsula poking into a sea which will slosh, repeatedly, during the shift. Thus, unless one were well up into the mountains on the mainland, survival would be tenuous and more the result of luck than planning. Plan on water washing over the entire peninsula. Plan on hot ash landing hundreds of miles from the large volcanoes which Italy is host to, and the possibility of new volcanoes oozing lava from places not yet known to man. Even on the mainland, unless one is more than 100 miles inland and well above 200 feet, one will find tidal bore and clashing waters forcing water up into ravines and even climbing cliffs. Italy is a country destined to suffer during the coming cataclysms, and those who would survive are advised to move, returning only after the shift.